Tonight we offer a “one pan meal”, because some nights, you don’t have enough strength to clean more than one pan after dinner! 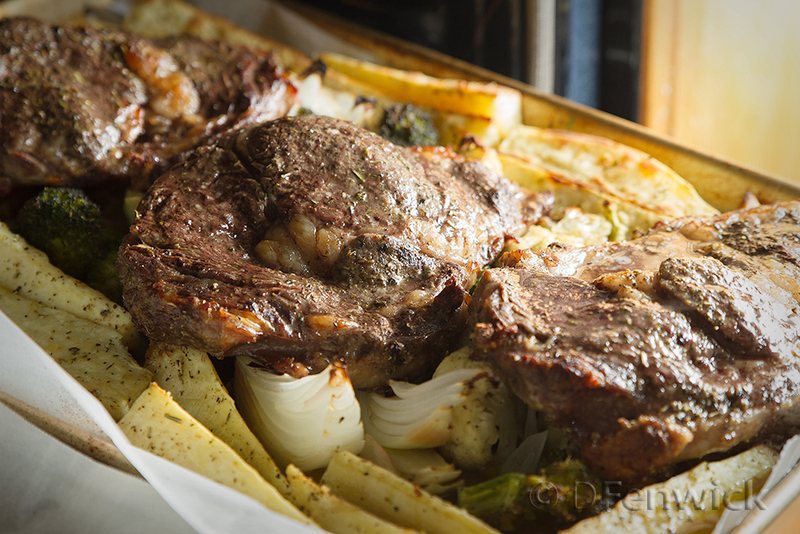 Preheat your oven to 400 degrees F. Line a half sheet pan with cooking parchment. Peal the sweet potatoes and cut into wedges. Cut the broccoli and cauliflower into florets. Cut your onion into wedges. (Or substitute your favorite vegetables that roast nicely.) Lightly coat the sweet potato wedges and the vegetables with olive oil. Toss with a bit of your steak seasoning. Lay the sweet potato wedges in around the edges. Place the rest of the vegetables in the middle of the pan, so you have a nice even layer in the pan. Season your steaks and lay them on top of the vegetables. Place your pan in the oven and bake at 400 degrees for 20 minutes or so. Turn the steaks over and cook until they are as done as you wish. Remove the steaks and cover with aluminum foil. Put the vegetables back in the oven and bake until the vegetables begin to brown. (The total cooking time was about 40 minutes in our oven.) Remove the vegetables from the oven. Serve the steaks with the vegetables and sweet potato wedges. Enjoy a delicious dinner, and the bonus – one pan in the sink!